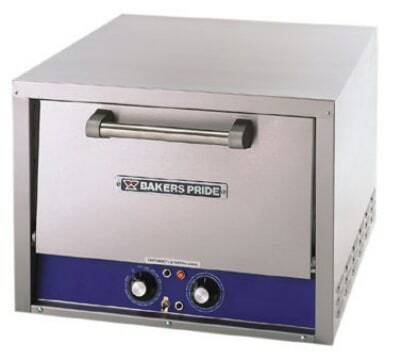 The Bakers Pride BK-18 electric countertop multi-purpose deck oven is ideal for baking breads, rolls and biscuits, as well as roasting meats and poultry. The unit has a stainless steel finish, and its features include a single bake chamber with a 7-1/2 inch deck height, a 60-minute electric timer with continuous ring alarm and manual shut-off, and a 140 to 550 degree thermostat. Its door handle is constructed of tubular stainless steel, and the whole unit is insulated with industrial grade insulation. Brick lining adds more heating intensity, quicker recovery and reduces baking time.